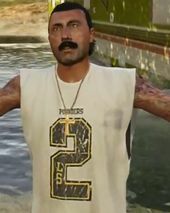 Ortega is a character in the HD Universe who appears as a minor character in Grand Theft Auto V. He is voiced by Héctor Ramos. Ortega is a member of the Los Varrios Aztecas gang and lives in a trailer close to the Zancudo River in Blaine County, San Andreas. In 2013 his trailer is pushed into the river by Trevor Philips using his vehicle, despite pleas from Ron Jakowski to avoid angering the Aztecas having already started a war against The Lost Brotherhood. Ortega survives the destruction of his trailer and emerges only to be confronted by Trevor, who can either kill or spare him. If the player spares Ortega, he joins other Aztecas gangsters in attacking Trevor's methamphetamine lab, joining the conflict with the last of the Aztecas. All the Aztecas, including Ortega, are killed. This page was last modified on 2 January 2014, at 15:37.